Fall is in the air here in the Northern Hemisphere. I absolutely love this time of year because this is when all the fabulous root vegetables like the various squashes, beats and pumpkin are found in abundance. 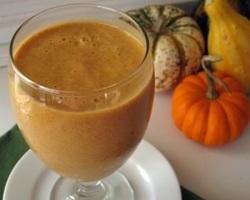 With Thanksgiving weekend just passing (in Canada), I thought I would put up a recipe post for Pumpkin Pie smoothie. This recipe tastes as delicious as a creamy pumpkin pie without any of the unhealthy ingredients. Instead of pumpkin pie filling, in this smoothie you’ll find pureed pumpkin and unsweetened coconut milk. Pure pumpkin is not only tasty, it is also chock full nutrients like fiber, iron, vitamin C, vitamin A (70% of your total daily intake from just one serving) and vitamin E. Vitamins A and E are important nutrients for our immune system, while fiber, as you know, is important for gut health. It is also low carbohydrate, only 5g per serving (3 of which are fiber), low calories, only 20 per serving, and low glycemic load (although the GI is 75 the GL is very low at only 3). Recently cauliflower was on sale for a great deal so I happened to purchase several and experimented with different cauliflower recipes. I love cauliflower because it’s such a versatile vegetable and a nutritional powerhouse. It contains several vitamins and minerals including vitamin C, vitamin K, magnesium, potassium, several B vitamins plus fiber and a dose of antioxidants. One of my recipe successes was a delicious cauliflower and cheddar soup. It was so rich and creamy you would think it was totally unhealthy. In fact, it’s so tasty I’m positive you could win over even the pickiest of eaters in your household – and you don’t even have to tell them it’s cauliflower! These are seriously delicious! But not only do they taste great, they are also healthy as well as quick and easy to make. So even if you don't exactly know one end of the knife from the other, you can make these pizza mushrooms - and they will taste great. I love to serve these up on a weeknight when I'm strapped for time along with a side salad. 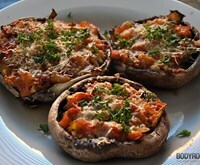 If you have children, I'm sure these pizza mushrooms will be a hit. Feel free to change up the toppings to suit your liking.